Jane: Look, who's in charge here? Jane: Don't be silly, I am. Now come on! Peter Pan: You're a traitor, Jane. You lied to me! And because you don't believe in fairies, Tink's light is going out! Jane: Not so fast, you old codfish! Or you'll have to answer to me! Captain Hook: Good heavens! Run! Run for your lives! It's... A little girl. Danny: Come on, Jane, we've beat old Captain Hook together! Danny: You use to, you were going to be the very first lost girl ever! Danny: Yeah, back when you were fun! Peter Pan: You know the rules, Hook. A good captain always goes down with his ship. Captain Hook: Mr. Smee, who is the most brazen, bold and brilliant buccaneer who ever sailed the briny blue? Smee & Pirates: Um, Blackbeard? Smee & Pirates: [stuffing Jane into a sack as she struggles to escape] Oh, come on now, don't fuss. Peter Pan: [Cubby cries very loud because of Tink's light going out] Ei! Put a cork in! Peter Pan: [listening to Tinkerbell] Uh-huh... uh-huh... What? 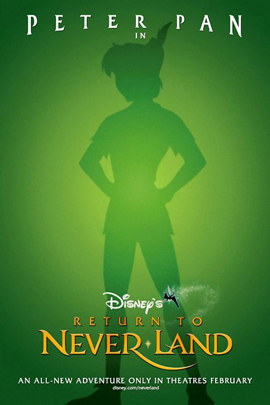 Peter Pan: If we don't get Jane to believe in fairies, Tink's light's gonna go out. Jane: Maybe you're full of hot air. Peter Pan: If you're not Wendy, then who are you? Jane: I'm her daughter, Jane. Peter Pan: Then if you're Wendy's daughter, you're gonna love it here. Jane: And I especially don't believe in fairies! Cubby: Uh Peter? I think there's something wrong with Tinkerbell. Nibs: Yeah all it takes is faith. Cubby: And uh, something else. Cubby: [bumps into Nibs] That's it, ow. Captain Hook: I tell you, Smee, this is driving me to delirium. I detest cephalopods! Smee & Pirates: Oh, goodness. Haven't we searched the island a thousand times before? Captain Hook: What was that, Mr. Smee? Smee & Pirates: I... I mean, hunting for Pan is, uh... fun galore. Peter Pan: How come you want to go home so bad? Jane: I have to get back to my family. Jane: I don't want to talk about it. Jane: If you must know we had a fight. Jane: I... told my little brother you weren't real. Jane: I don't know. But I've got to go back and set things right. Jane: She tried to kill me! Peter Pan: She's just jealous. All girls get like that around me. Jane: Oh, how very nice for you. Cubby: Let's play the "Don't hit Cubby over the head" game. Jane: You promised no one would get hurt. You gave your word. Captain Hook: And Captain Hook always keeps his word. I promised I would not harm a hair on Peter Pan's head. Captain Hook: And this is the one I won't harm. Here, you keep it. Captain Hook: The rest of him is mine.